Those cute flip-flops and dressy flat sandals you have in your closet could be responsible for your foot and ankle pain. Doctors are concerned about how frequently we’re wearing shoes without proper arch support. “You don’t have the arch support. A lot of times people develop osteoarthritis in what we call the midtarsal joint or the middle of the foot. 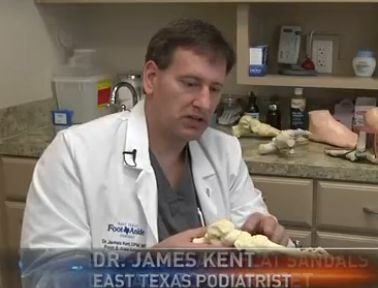 The repetitive pounding in this area caused this bone spur or increased height of the bone due to the fact that there is nothing underneath it to cause the arch to be elevated,” says podiatrist, Dr. James Kent. We see lots of arch problems here at Family Foot & Ankle. Living by the beach area, Californians are used to throwing on a pair of flip-flops or sandals and racing outside. Watch out though: excessive use can lead to life-long problems with your feet, since they give you no arch support. One of the most common problems we see day to day is over-strained feet getting a case of Plantar Fasciitis. Once the arch damage is done, then we provide custom-made medical orthotics that will help your feet as well as your overall gait and posture. Foot problems often lead to knee problems, hip and/or back problems down the road. Make sure you don’t wait too long before you see us, because the more you wait the harder it becomes to treat the damage.